Legislators returned to Raleigh on Wednesday for the official start to the 2019 long session. Throughout the week leadership solidified legislative rules and selected committee members, while Senators and Representatives moved and settled into their offices. House Speaker Moore announced a new approach to the weekly schedule for the North Carolina General Assembly (NCGA) House of Representatives (House). On Mondays, the House Rules Committee, which vets and determines committee assignments for newly filed legislation, will meet prior to the evening Monday session. At this time, the Monday evening sessions will be a no recorded vote session unless a vote is necessary on legislation. Tuesdays will be dedicated to committee meetings to allow ample time to debate and amend bills. Committees will continue to meet on Wednesdays and Thursdays, however, the focus will be on House floor sessions. Speaker Moore wants to maximize committee time to ensure legislation is thoroughly vetted. The House also proposed permanent rules to set aside two vacation weeks when no votes will be taken: April 22-26 and July 1-6. The application end date is rapidly approaching to sign up for the NC Governor, Senate, and House Page programs. The deadline to register and be a part of the three-day Youth Legislative Assembly is Wednesday, February 13. Youth must be between the ages of 14 and 18 to be eligible for each program. 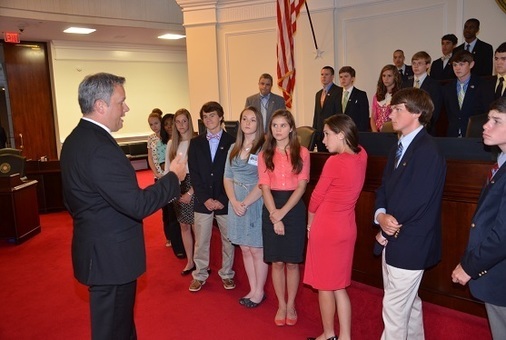 To learn more and register for these incredible opportunities to experience state government, see the links below. 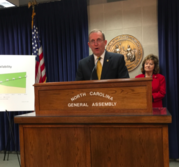 On Wednesday of this week, Senate Majority Leader Harry Brown (R- Onslow), along with Senators Krawiec (R-Forsyth) and Harrington (R- Gaston), held a press conference to introduce Senate Bill 5. A full description of the bill is included below. 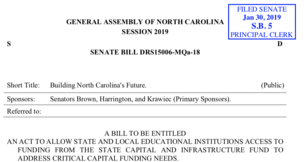 This is the Senate’s alternative proposal to the House's education bond which has been championed by both House Speaker Tim Moore (R- Cleveland) and Governor Roy Cooper (D). The presentation delivered at the press conference can be viewed here. As mentioned above, Senate Bill 5 serves as an alternative to the House education bond plan proposed by Speaker Tim Moore. The Senate plan divides $6 billion dollars equally into three categories: K-12 Schools, community colleges and UNC System campuses, and state agency buildings. The plan would authorize K-12 and community college programs to embark on new capital projects and begin safety enhancements. In addition, the plan would put in statute $100 million dollars worth of lottery funds toward the Public School Capital Fund each year. NC State Superintendent of Schools Mark Johnson commented on the matter saying, "... I look forward to working with our partners in the General Assembly as we continue to discuss the details of that funding." Senate Bill 8 is a bill affecting Bertie County. The bill was introduced by Senators Smith (D) and Lowe (D). 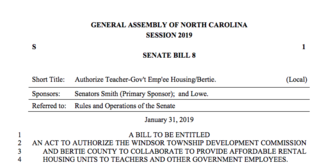 The bill effectively allows the Windsor Township Commission to collaborate with Bertie County regarding the ability for teachers and government employees to enter into leases and management agreements regarding affordable rental housing units. The bill does not exempt the units from having to comply with applicable building codes and other safety regulations. Amends GS 115C-84.2(d) to allow the Catawba and Davie County Schools, Hickory Public Schools, and Newton-Conover City Schools local boards of education to schedule school opening and closing dates for any school in their district to coincide with the opening and closing dates of Catawba Valley Community College or Davidson County Community College. This would apply beginning with the 2019-20 school year. In addition, House Speaker Moore appointed the following House members to serve on all House committees: Speaker Pro Tempore Sarah Stevens (R) Rep. David Lewis (R), House Majority Leader Rep. John Bell (R), and House Deputy Majority Leader Rep. Brenden Jones (R). 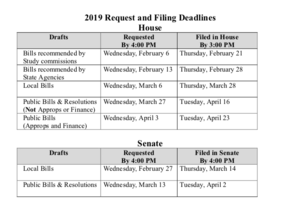 To the right are the 2019 bill filing deadlines for both the House and the Senate. The crossover deadline is Thursday, May 9th. This means that any bill with no fiscal bearing that does not make it to the other chamber by May 9th is effectively dead. In this Ed NC article previewing the 2019 Legislative Session, Cecilia Holden, Director of Government and Community Relations, Drew Elliot, Director of Communications for DPI, and Representative Craig Horn share their thoughts on the session that began on Wednesday. Cecilia discusses the influx of millennial teachers and the importance of emphasizing "learning" and "a sense of purpose" for teachers and mentors, as Drew highlights the professional development of teachers and the long session initiatives of Superintendent Mark Johnson. The North Carolina State Board of Education is set to hold their February meeting next week on Wed., February 6 and Thurs., Feb. 7. The audio stream of the meetings can be accessed at this link. For a list of the K-12 public education districts click here and for a list of State Board members for each district, click here. The meeting agendas can be accessed at the links below. Get to Know Our Spring Intern Greear! Greear Webb has joined the State Board of Education Office as an intern for the spring semester and long session. 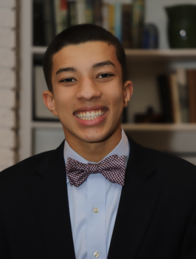 Greear is a high school senior in his final semester at Sanderson High School in Raleigh and is a finalist for the UNC-CH Morehead Scholarship. Greear is passionate about keeping students safe in school, even organizing the NC Town Hall on School Safety in the aftermath of the Parkland, FL shooting. His town hall in Raleigh drew upwards of 700 people who were anxious to hear possible school security solutions from current students. Greear is a former intern with the Legislative Action department of the NC Medical Society. Greear will be assisting in writing newsletters and with the State Board’s legislative initiatives. If you would like to share input for the session or welcome him to public service, he can be contacted at Greear.webb@dpi.nc.gov. 2019 Long Session link for bills impacting K-12 education. - H12: School Calendar Flexibility/Alamance County. - H13: School Calendar Flexibility/Certain Systems. To view previous 2019 Weekly Legislative Updates click here. The NC Department of Public instruction offers a number of topics for subscription. To subscribe to the Weekly Legislative Update, click here. To subscribe to other NC Department of Public Instruction topics, click here.